Don’t forget to play in your own Backyard! A visit from a friend last week reminded me of how easy it is to neglect exploring one’s “own backyard”. It had been a while since I had ventured out to the Gorge. Along the historic Columbia River Highway are vast forests of moss and lichen covered trees, waterfalls cascading down steep hillsides and a gentle mist saturating the air. 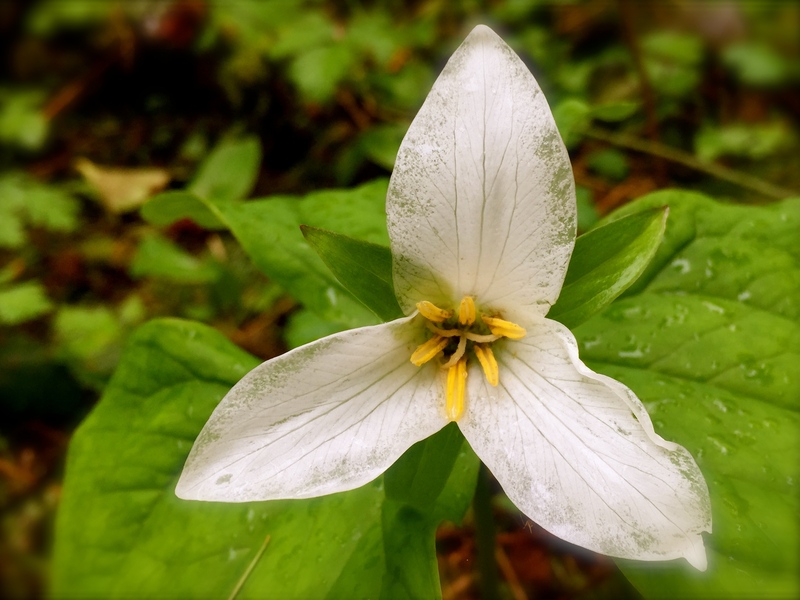 Hillsides were dotted with blooming Trilliums. The trail to the Bridal Veil waterfalls wound through the woods, along a small roaring creek. 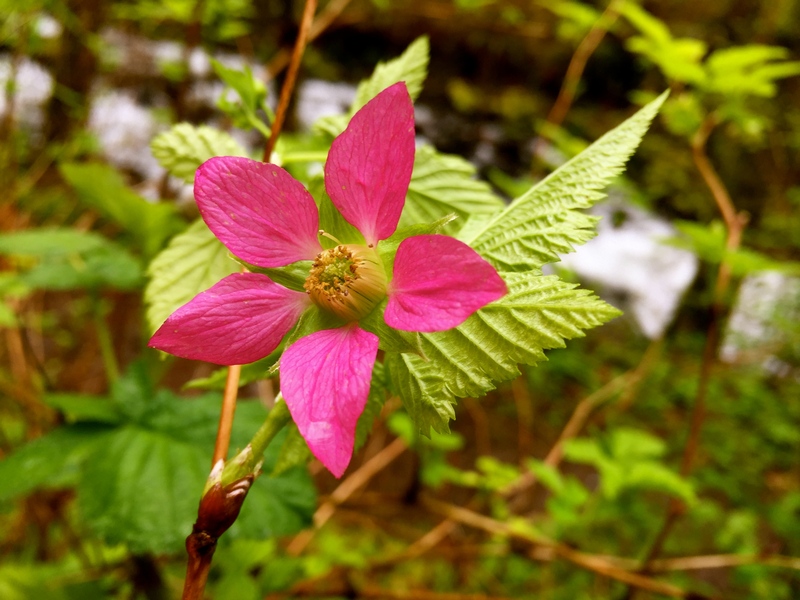 Wild raspberry blossoms, lush emerald green ferns unrolling young fronds, birds chirping in the trees, and the misty, crisp air made for a perfect outing. Upon reaching the waterfall, we watched a young woman carefully move across a log at the creek. Half way across, she paused, waved to her friends taking her picture and then scampered on to the other side. Multnomah Falls was next. By this time, the drizzle had gotten steadier and the top of the waterfall was shrouded in a thick mist. Hiking past the upper bridge gave us a great view of the waterfall, the ponds down below and the Columbia River. We saw few people, since it was the middle of the week. This area has lots day-use and picnic areas, plenty of great hiking trails (from super easy to difficult) to the many waterfalls in the Gorge, and some of the most beautiful scenery on earth. Plenty of rain helps keep the Pacific Northwest green. It also makes for more spectacular waterfalls, roaring streams and plentiful wildflowers in the spring. This visit reminded me of how lucky I am to live so close to this breathtaking beautiful area. Upon leaving, I promised myself to head out to the Gorge more often! If only everyone had a “backyard ” as beautiful as this…beautiful post! We are lucky here! I also hope to visit your backyard some day. Birdwatching in Central Park is on my to-do list. Watched a documentary on it and it seems very special. Really I should do that myself , there are a couple of secret gardens within the park that I want to visit. A lot of NYC remains a secret by people that live here as well. Have you thought about the Catskills and Bear Mountain as well ? Lots of wooded areas to hike and bird watch. I will check on those places. When you go to Central Park take photos. I would love to see them. I will, I live far from the park so I will make a day of it to see as much as possible. Thank you so much. I bookmarked the article. When I make it to NY, we should meet for lunch. Sure. That would be amazing! We’ll be wishing for this rain in a couple of months. I love the video’s. Makes me feel like I’m there. It was so much fun to go there. And it’s not very far. If you ever feel like going, let me know. I am always ready for an adventure. What a lovely way to spend the afternoon; such a beautiful area. It was, especially without crowds. I hope to go back out there next week and check on the wild flowers. Thanks for stopping by. I hope you make it. Happy Easter. Next week for sure. Happy Easter to you too! My husband and I had our 10th anniversary last year and we debated between a Maine trip and a Pacific Northwest trip. We picked Maine, but based on this post I’m thinking that our next trip better take us west. Beautiful! This is my favorite place I’ve ever lived. Great scenery and super nice people. Definitely worth a visit. I do hope to get to Maine someday. It too looks beautiful.